What is a Word, Anyway? The word must sound somewhat like the real, adult version of the word. We don’t expect perfection: Approximations (like part of the word) count. But if a child said “baboo” most likely that would not be a word referring to a cat (unless of course, the cat’s name is Baboo). 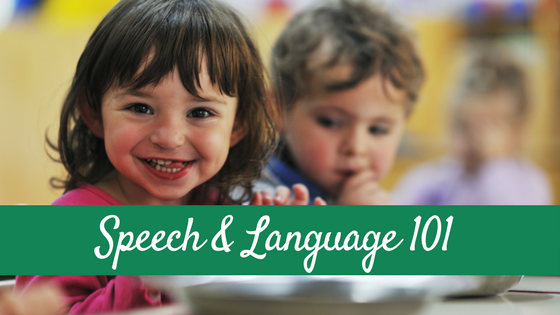 It is also important to remember that children are not born being able to produce all the speech sounds of their language and it is a process that happens over years, so the words can have errors yet still sound like the real, adult word. For example, a toddler may say “Ta” or “tat” or “ca” or “cak” for cat and those all could be considered a word as long as it also meets the next criteria. To be a real word the word must also be used consistently in the presence of the object with intent and meaning. For example, a six month old saying dadadada while he is playing with his toys while daddy is at work is likely not a true word. A 10 month old who says “dadada” when daddy walks in the door and says it while looking at daddy (showing meaning and intent) and does it consistently (meaning many different times) is most likely a real word. So, back to my own daughter at her 12 month check up. Yes, E said mamamama but not to refer to me. Not to request me. In fact, she did not use “mama” like that until she was 18 months old. And her speech and language development was well within the normal range. However she did say “dada” consistently and with intent to refer to her daddy somewhere around 13-14 months. So what was my daughter’s first word? What Kind of Words Will My Child Say First? When Should I Expect the First Word? Remember when I said earlier that the 6 month old saying “mamamama” is most likely not really saying mama? The typical range of “normal” for the first word is between 8-16 months. My daughter said her first real word around a year where as my son’s first word was at 9.5 months. Interestingly, it was my daughter who’s speech grew quickly from her first word where as my son’s did not. The age of the first word has no correlation with intelligence so don’t worry of your child is on the end of the “normal” range. 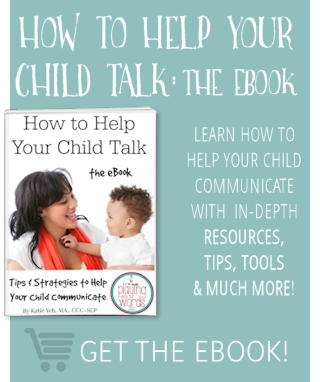 However…between 12 and 15 months we do want to see your child communicating even if it is not with words. We want him pointing, gesturing, making eye contact, smiling, laughing, protesting (yes, protesting!) and so on. We want him imitating gross motor movements (like stomping feet) and responding to his name. Check my Red Flags section for more information. Regardless of the amount of words during this time frame…zero to 100…we need your little one meeting all these other milestones. Now you know what MY children’s first words are. What about yours? I want to hear! 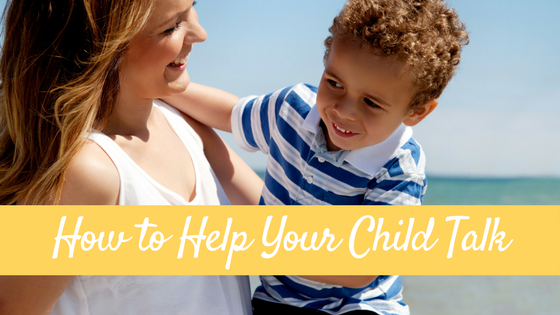 Also, be sure to head over to Love, Play, Learn and check out my gust post today: 5 Things You Need to Know about Your Toddler’s Speech & Language Development. It’s a goody! My oldest’s first word was Mom. My 8 month old recently started saying “ball” and it is stinkin’ adorable!! Cerys Everett (my 21 month old) said “what’s that?” early on as well! “Whats dat?” and “Dat” were common around here. LOVE hearing about these first words! My son is 13 months and just recently said his first word. His first word was, “Uh-oh!”It’s from a page in one of his favorite books. He has said “Baba” (bottle) and “Dada” in a meaningful way, but only once or twice. He says Uh-oh several times a day. Also, when his doctor asked if he had spoken in words at his 12 month check-up, I told her no; he only said mamamama or dadadadda but never in relation to us. She said that was perfectly normal. Thanks for the reminder that there is a wide range of normal. I know this is true but I still catch myself feeling concerned that he is not speaking much yet. Our son’s first word was ‘Down’! As in ‘I want down from the table’ & ‘I dropped it and it fell down’. We used baby sign with him and all of his first words were also signs he used. I found that interesting. Down is a great one! One of my daughters first words (after NO) was “up”. Ironically with my daughter she chose to sign the signs and say words she didn’t know signs for. For example, she signed “more” FOREVER and would NOT say it. I love how each child is so different! my daughter, 16 months, is like that too. She says some words, but for other words she will solely sign them- won’t attempt to say them. Is that OK? Great post! I’m glad I’m not the only one who has received that “look” from a nurse! 😉 My youngest’s first word was “no” as well, quickly followed by “dada” (intentional) and “dit down”…”mama” FINALLY started popping up (intentionally) around 20 months. He just didn’t see a need to say it, especially with his older brothers saying it all the time for him! Ha ha Stefani..I wonder how many of us have gotten “the look”? 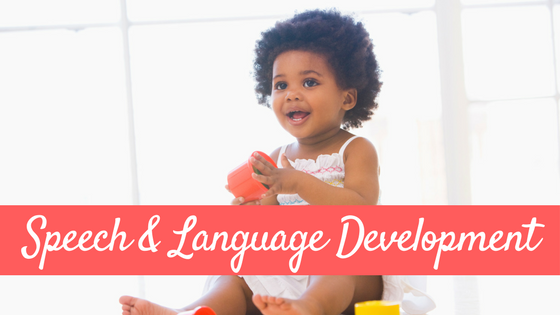 😉 Being a parent has also really helped me bring my knowledge of speech and language development to light. I’ve learned a LOT from my own children of what is “normal” and what isn’t. I used some basic signs with my son (more, all done, milk, eat) starting around 7 months. His first word/frozen phrase was “All done” around 12 months. It worked well because it helped him communicate in different situations such as eating, playing, bath, etc. My son could speak eloquently (for a baby) at 6 months. Sentences-correctly used and understandable to most anyone who could hear baby pitch voices. By a year he had a huge wealth of words (oddly, NEVER mama–I was always around, what was the point? I think was his thought process) It wasn’t until he finally had him tested (in high school) for learning disabilities that we learned that his high level of early speech actually was a precursor/warning sign of his learning challenges. Next child: not a single “real” word until 3 days before her 2-year-old check up. I had been after her doctor to check her hearing,etc because she really would just cry, grunt, and generally have her brother talk for her. Her first word? “Look Joseph! Funny horsey eating daddy’s shirt” (unless you count the mimic of “You’ve got mail” on AOL or “french toast outfit” when offering her choices in desperate attempts to get her to talk.) She came home from that outing to the pumpkin patch chattering in full sentences and didn’t stop talking until she was a teenager. Notable because she had had a full on temper tantrum right before going out because I offered juice or milk and she had refused to point and just screamed and melted down into kicking puddle on the kitchen floor. Youngest child: incredibly typical progression of babble into words. Granted she had a few oddly large words early on–but all my children did. My oldest daughter’s first word was diaper. I was shocked since she was only 9 months old. I wasn’t going to count it unless she said it again. Sure enough, she repeated it several times while being changed. She was a very early talker. My other daughter’s first word was probably ball or bath. Yet she never quite got the ending sound in there, but you knew exactly what she was referring to. I never counted mama or dada since our pediatrician always wanted to know words other then those, Surprisingly all three of our kids first two words were cat and balloon. The oldest said key and boon, the second said boo first and then cat, and the third said ca and ba (for ball or balloon). Both of my babies said the same first word on the same day. Our wonderful SLP was working with my 23m old son and blowing bubbles with him and my 11m old daughter. She said “buh-buh!” Gleefully over and over to get more bubbles, and then her big brother copied her and said “bubble” clearly! It was so exciting for us! I LOVE hearing these stories. And how sweet that both your babies said the same word on the same day. Such a sweet memory! Thanks so very much for sharing this sweet moment with us. That would be exciting! So cute! Ann my son is 21 months and just these last couple weeks REALLY started using Mama to call me 🙂 He also used “that” fairly early. Hi Whitney. Wow 6 months is very early for words! But it does happen once in a while. I am no expert in Dyslexia and have not heard that early speech development can be a sign. However all you can do is love on him and give him lots of learning opportunities, read him lots of books, and talk to him a lot 🙂 Good luck to you! Does “uh-oh” count as a word? My 12mo has been saying that for a couple of months now when she sees something fall on the floor or if something stops. (My husband thinks it’s too negative and is encouraging her to say ‘yay’…) But she uses it with intent and meaning, consistently. I think of “uh oh” as a word…It is a comment and there is no reason to discourage it. She is communicating! My daughter has been saying “kitty” everytime one of the cats walks in the room for about 2 months now. She is almost 9 months old. My older son (age 2) is deaf and has bilateral cochlear implants. 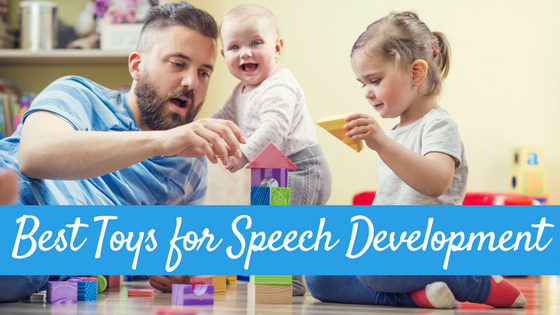 I think the fact that she is attending speech therapy with him 2-3 times a week and having the extra language activities that we do at our house daily have been a factor in her early language development. She imitates sounds at therapy and understands a lot of words. My oldest son’s first word was all done, “ah Dee” he would say while signing it after meals at 7 months. Soon after he began saying hi as well. My now 13 month old just started saying his first word, hi, and when he wasn’t speaking by 9 months I was freaking out. The pediatrician had to assure me that older brother was the exception not the rule. YES! So true. 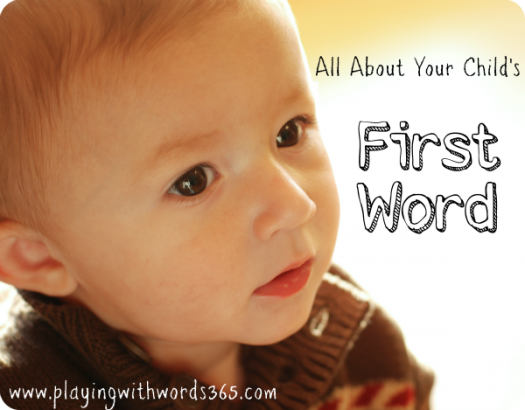 The average first word is actually around a year….but it is hard as a parent to not compare your kids! My first sons was “baby” and “cheese” i guess because we always called him baby. And one day I was getting cheese out of the fridge and telling him and he just copied me and it stuck. and my younger sons was “more” as in more food, he’s a little piggy! My son’s first word was “Dog” although he says “Gog” and I LOVE hearing it! My oldest talked very early and by 15 months (when baby 2 was born) was speaking in sentences….he told the nurse at the hospital, “my mommy is having baby today”….baby #2 a girl I knew from about 9-12 months she was different….dr kept telling me I was comparing and that my son had just been very advanced. At 2 she started listening to me and my daughter was diagnosed with speech/language delay (which we are still dealing with at 4). Anyway, I am overly paranoid with my third child (another girl) who is 14 months….actually called EI and she doesn’t qualify but is “slightly” behind. Honestly she seems way different than my other daughter, much more social and I know her receptive language is better…. She has said mama and dada but not calling us. I think her true first word (that she has used more than once or twice) is peek a boo….well eeeaaboo to be exact.she has done it several times imitating me or when I cover my eyes and move them she will do hers and say it. Does this count as a word?? My little girl’s first real word was “duck”. Her bed time story ( every night) is about a duck and one day around 8 months or so she grabbed a yellow rubber ducky ( also her favorite toy) and said “uck”…we were so thrilled and she was so excited by our cheers and giggles she repeated it continuously every time she saw the duck for days. My oldest’s (currently 31m) first word was “hot” at about 14 months. He said it every time we got in the car when we were living in Phoenix at the time. He has been very delayed and while doing speech one day with his therapist they were practicing “buh” sounds for bubble and bye bye and his sister was across the room (9m) saying “buhba, buhba.” It has helped her to participate in speech therapy with her big brother! We are happy they are both making some strides. I am so happy to have found your blog. You are a wealth of information. Thanks. My daughter will turn 7 months old in three days and has a bit of an obsession with standing but can’t get up on her own yet and she was lying on her play mat on her back and looked at me held out both her hands out to me lifted her head up and said “up” (and has been doing it all day now! I’m in absolute awe and I wasn’t even sure if a baby her age could talk! At about 7 months or so, my son started calling his dad ‘appa’ quite clearly(that’s the word for father in my language). But mysteriously, after a while he regressed! He is 16 months old now, and starting to relearn the word! My son’s first word was “hot”. I never thought the word hot could be so cute! He was 11 months old. He is 14 months now and says mama, this, rawr, ninny, and something that is supposed to be cockatoo-doodle-doo. I’ve been told by my parents that my first word was ‘gargoyle’. Is that weird? I used to watch the animated TV show Gargoyles a lot with my brother though. “Duh..gi”…he is also supposedly calling all birds “gaga” but often can sound like “agehe” etc…the rest are hard work in attempt to yell something in baby jargon or “talk” long sentences with sounds like g, h, d and b. There is absolutely NO mama coming up anytime soon! My boy is turning 16 months this Wednesday, and he does not say a single word yet. He is generous with his smiles and laughs, he shakes hands, gives “high fives”, waves, shakes his head “no”, claps, gives kisses, points at every single vehicle and dog both in real life and in books, makes vehicle sounds, signs “more” and does a mix of “thank you” and blowing a kiss (often followed by a “muah”). He’s been babbling in what seems like full sentences for months now, but there are no real words. I am not terribly concerned, because a) he is being raised bilingual (one parent one language approach) and b) his father did not talk until he was 26 months old, and then started conversing in full sentences, overnight. Is there anything I should be looking out for, though? Anything extra we should do? At 6 months our son called mom “dada” he babbled it for a week and shortly after that first week we realized it meant he wanted mama. By 7 months he had mama and dada down using then correctly and his first word after that was “good” at 7 1/2 months. Now 12 months 3 weeks he has a vocab of 50 or more words only two are somewhat modified, ky for sky and deyyight for day light. His favorites are good job or good dog and go cook. Very rarely does he not use the proper context. My 18 month old has about 10 words, makes animal sounds, has excellent receptive language but she does not call me mama or her dad dada. She says both of these words, however, but not with intent. I’m going crazy over this! What are your thoughts? My 15 month old says duck. Well she says “ck” but to everything that has a beak. That’s about all tho. Lol. She knows momma and dada. Should I be concerned? 1) My 14-month old doesn’t point ever, except when wanting to touch fingers E.T. style. Is that an issue? She does gesture hi, bye, more, all done, milk, and want (I think). 2) She was saying ‘mamamama’ when reaching for me or looking for me at 10 months, but stopped at some point. Is that normal? She does say ‘dada’ when referring to her dad, and sometimes uses ‘meh-meh’ when she wants me. 3) I thought her first word was ‘da!’ for duck. But now she uses it for all animals — dogs, pigeons, cats, etc. Does ‘da!’ count as a word if it’s being applied to a general category? Gibson’s first word was ‘Tat’ (cat) at around 10 months of age. He is now 13 months and still won’t say mama or dada but he will request a Lady Gaga video by saying ‘Gaga!’ Or ask to go outside by saying ‘out-tite’! He now says words like ‘gog” for dog, his name, ‘Ditson’, and ‘daff! !’ For bath. Still no mama or dad though!! I am so grateful to you for expending time, and energy to create extensive blog posts on this matter. My son is 14 months, and he uses the sign for food when he is hungry and will use it, then go to his high chair expecting food. He reacts well with emotion, uses eye contact, has preferences, points to the things he is babbling about. He uses gestures to express excitement or confusion, and so many other ways of expressing himself that his father and I, and strangers, are able to understand. But no words! He babbles sounds similar to words and many other parents have tried to tell me “it counts,” while I didn’t feel that he was really using them yet- still other parents (and SO MANY online forums!) have told me he is falling behind and I should be alarmed, and taking proactive action with flashcards and other methods to force speech along quickly. As his mother, my instincts had never led me to feel that anything was wrong or that he was behind in any way, but social pressure is a very real and scary thing to face. I appreciate knowing there is a qualified and credentialed professional making information like this available to mom’s like me. Thank you so much! I found your article to be very informative and comforting. At 6 months my son was saying dadada, whenever he was asked to say dada he would repeat it but it was always during play time and his father was never around. Now he’s seven months and he says ‘a’ quite a lot, and no more dada, he just smiles at the request. I was wondering if he was regressing but from this article I realized that my fears are unwarranted. Thank you! Thanks for your information:).. But in my case my son said mommy by looking at my eyes when I was feeding him banana @ 6 month.then he did not repeat it till he was 10 month.at 10 month he could say abc till k and recognize some of those..he started to repeat word which we speak..like correct,tree,sky,sahit,three,two,thaaa means thank you,mixi,good……thanks you!!! My daughter’s first word around 8-9 months was kitty! We have 2 cats and she’s obsessed with them. She’s now 15 months and the only other words she says are Hi, momma and dada. She uses lots of different sounds while babbling, and “reading” to herself. Waiting for her to explode with words any day. Hi Katie! Question for you! My son is 17 mo old and I’m trying to get a tally of his words. I’m wondering if words like “eww” (if something is gross, or when he points to diapers after being changed) and “brrr” count as words? Also, do animal sounds count? Thank you for this lovely, clear and non-alarmist article. I found this very helpful. My 14 month son clearly says ‘Wha-dat?’ whilst pointing but still does not say ‘Mummy’. My health visitor was very alarmed but I instinctively didn’t feel worried. This has put my mind at rest. Thank you so much for this RICH information. My son is 9 months and for about a month has been saying “ahgeh” after I do a few specific things he likes (most of all when I go “ahhhh ahhh ahhh achoo sneeeeeeezzzzzze” which he loves). He says it until I do it again then of course after he says it once more ;). I Feel like he is saying “again” to make me repeat the desired action (he also says it when I touch his nose going “nooooozzzzzeeee”. He loves “zzz” sounds.) he says it mostly in context. Is that a real word? He seems to not say mama and dada. In fact I’m not sure he even understands them (if I ask “where’s daddy” he will look at me sometimes – I’m mummy! But sometimes he seems to understand.) he doesn’t say many “mm” or “d” sounds. Lots of “ba” and “ga” and clicks and razzing. Clicks like mad. Also pah sounds like with a pop like imitating a fish but not so much d or m. He’ll go mmm when eating and sometimes he babbles a da but it’s rare and usually it’s like babababadaba or something. Like it was an accident maybe. My sons first word was bye bye , followed by dad then who’s there? And what’s that? He’s 16 months old today. Sounds like your little boy. My baby (17 months) says “ow” “ewe” “uh-oh” constantly and calls anything that contains water (sinks showers glasses etc.) “wawa” constantly are these real words ?he says Dada and mama both to us and when we are not around he also says Dada about almost anything at all. he gesture with the full hand but does not point is there a difference? Do words like whoa and wow count as words if used in context? 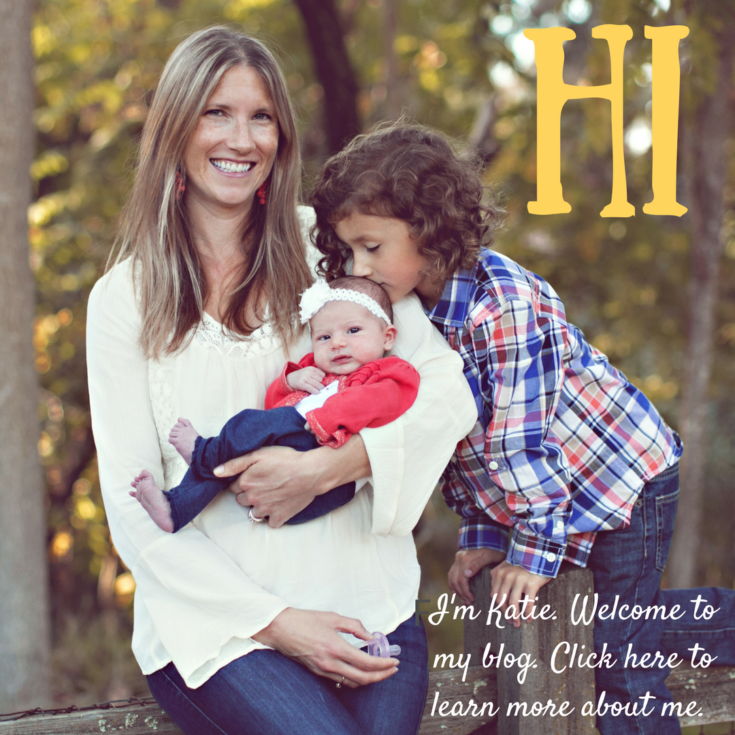 I just want to tell you that I so appreciate this blog from a licensed professional and mama! I hear such widely different things from different medical providers about my son’s development, and I am so relieved to know he is totally typical. Thank you for your insights!